Took myself off to Regton this morning to buy a new finds pouch, my third since I started detecting in October 2011. For some reason I seem to do a Jack the Ripper on them and tear them apart at the seams. Oh, the expense! I talked to Marcus about my continuing lack of finds on my permission. Marcus’s view was that if the Deus isn’t getting a signal there really is nothing there, which is what I have been concluding myself over recent weeks. Buggeration. Yesterday I decided to detect up the line of the old road, as close as I could get to it. My hypothesis with this permission has always been that people in the past were no different from modern motorists and were happy to chuck rubbish out of their cart along the road side as they passed; but also that travellers in times past, moving as they did on foot, horseback or by cart, were much more likely to stop by the roadside or pull off for a rest, so there should be random lost or thrown-away stuff along the old road margins to be found. Nice idea, eh? Needless to say it didn’t work out that way. I detected right along the edge of the road, up gently rising ground to the field boundary, beyond which lay a belt of trees and an open hill top. And found absolutely nothing except a couple of shotgun cartridges. Not a broken button, not even other rubbish. What’s going on, eh? Out of curiosity I peered looked down through the foliage into the hollow way that was the old road. Bloody hell! At this point it was at least 10 feet deep, steep-sided and as dark as Hades down there. Talk about a place for an ambush! There wasn’t a cat in Hell’s chance of any traveller pulling off onto the roadside to rest his sweaty feet in the sun. Here be Dragons! My hypothesis duly kyboshed, I spent a while detecting around the slopes of the hill. The ground was more highly mineralised in this area, the soil was rather heavy clay and the few holes I dug produced the odd piece of rubbish and bits of charcoal. Just charcoal, though. No brick, tile, glass or other evidence of habitation, and the few clumps of nettles nearby were up the slope from where I was digging. For the last hour I made my way down the slope and across a flat part of the field. 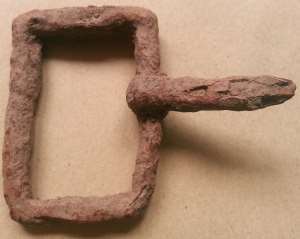 This produced a broken copper alloy buckle and what appears to be the remains of a hinge. The latter is not magnetic (according to my trusty fridge magnet) though there are traces of rust in a few places. I suppose I could throw it away, but that would make me unhinged. I returned to the patch I detected two days ago and started from where I’d left off previously, crossing the field parallel to the fence as before. The weather was much better this time – at least there was no hail and at times it was warm enough to shed my fleece. The return pass along the fence provided the first find of the day, a curious decorative lead item that looks like a stud and screw, the stud being an octofoil design with a round bead in the centre. As far as I can work out it’s a furniture fitting, probably of 18th century date. After three hours detecting I had finished the semi-enclosed area and had reached the open field. With an hour still available to detect I decided to take a bit of a random wander around the field close to the line of the old road. That hour produced two thimbles, one missing its tip, and a small lead cylinder which might be a weight of some sort. It’s still pretty pathetic for 4 hours detecting though, eh? Finds: 1 decorative lead item, 2 thimbles and 1 lead cylinder. Tried my luck yesterday in the small area in Field 5, between the two old roads, that I’ve been itching to get on for months. The farmer had told me that most of it had been fenced off and planted with saplings, which proved to be true. While I could have gone in the enclosure there wouldn’t have been much point as the grass, not being grazed by the sheep, was more than knee high. If it’s to be done at all it will have to be early in the spring before the grass begins to grow. I detected in sweeps parallel to the aforementioned fence, making half a dozen passes and keeping a wary eye on the scudding banks of cloud rolling in from the north. Every so often one came on much blacker than the rest, gradually covering the whole sky and turning daylight into a sort of twilight. Then the hail would begin to fall, pelting down like a gauzy curtain moving across the fields. In four hours detecting I dodged as many of these storms and two normal but heavy rain showers, taking shelter under an overhanging tree and breaking out the flask of coffee while they passed. In theory this should have been a productive spot but in practice was worryingly thin on finds. Not just on finds, but on signals generally. The only finds of the day were a button, a bullet and a copper alloy ring of a sort that is variously identified on metal detecting forums as Dorset buttons and belt rings. However a couple of similar rings I showed to the FLO last year came back identified as curtain rings of indeterminate medieval or early modern period, but dating from the period when many houses were internally divided by curtains rather than walls. Finds: 1 button, 1 bullet and 1 copper alloy ring. Damage has been caused to the grounds of the historic Whitby Abbey by illegal metal detecting. Since March, 14 holes have been dug across the Grade I-listed site while the property is closed at night. 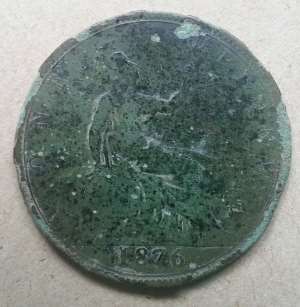 English Heritage and police believe it is the result of illegal metal detecting, known as nighthawking. I arrived at the farm today to discover that Field 4 was now empty of sheep and was therefore accessible. When I first started detecting this farm the farmer asked me to detect a particular field (Field 1) which was bordered on one side by the concrete access road to the farm and on a second by an old hollow way. In spring 2012 I had some success towards the bottom end of Field 1 alongside the hollow way, and found a badly broken Polden Hill type fibula, a broken Roman knife and a medieval harness mount, all of which have been recorded by the Portable Antiquities Scheme. Access to Field 4 allowed me to follow the old hollow way about 20 yards further without finding anything but a few bits of scrap. Following then the edge of the spinney I dug up half a dozen shotgun cartidges and 3 very strange objects from 3 separate holes only a few inches apart. They are not iron and have many small nobbles and casting faults on what appears to be the inside. Two of the pieces have an incised rim. No idea what they are, so will show them to the FLO. Returning across the field, found 3 very ordinary buttons in separate spots and more shotgun cartridges. All in all, rather disappointing.